Lost? 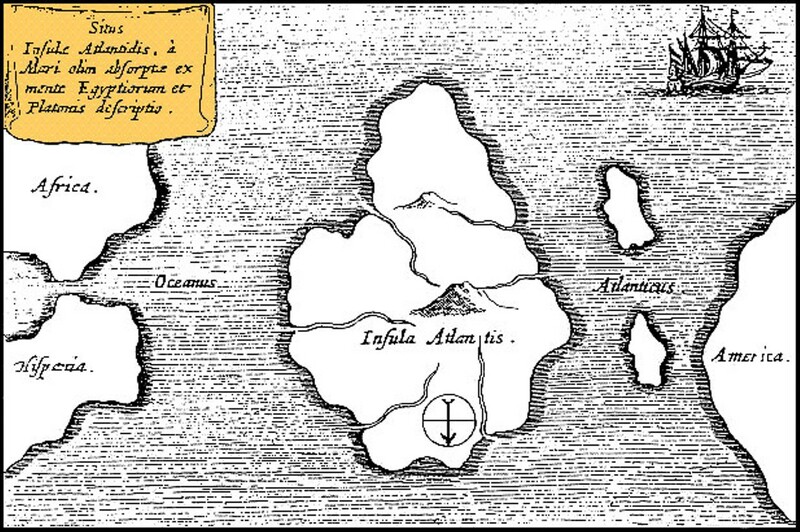 The island of Atlantis lay between Africa and the Americas, according to Athanasius Kircher's map of 1669. South at top. The Greek philosopher Plato couldn't have known what he was starting when he wrote about Atlantis. In one of his many dialogs, or accounts of conversations his teacher Socrates had with Athenian scholars and statesmen of his day, he introduces us to the lost land of Atlantis: "In front of the pillars of Heracles [i.e. beyond the Strait of Gibraltar] there lay an island which was larger than Libya and Asia together. ... Now in this island of Atlantis there existed a confederation of kings, of great and marvelous power, which held sway over all the island." In the next dialog, written around 360 BC, Plato has his great-uncle Critias recount the fall of Atlantis 9,000 years earlier, after the Atlanteans conquered most of Mediterranean basin. Having defeated Libya, Egypt and much of southern Europe, it attacked Athens. Bad move. Not only did the Athenians fight them off, but the Athenian gods took vengeance, sending "portentous earthquakes and floods, and one grievous day and night befell them, when the whole body of your warriors was swallowed up by the earth, and the island of Atlantis in like manner was swallowed up by the sea and vanished." Needless to say, there was no city-state of Athens 9,000 years earlier, so did Plato create up the whole story out of thin air, perhaps as a fable to glorify the might and virtue of Athens? Or was he embellishing some ancient legend about a real island? One tradition holds that he was recounting a three-century old story told by the father of Athenian democracy, Solon, who had heard it from Egyptian priests. Fable or not, writers ancient and modern have re-told, embellished and generally had a fine old time with Atlantis, either as allegory (Thomas More and Francis Bacon took Atlantis as their starting points for promoting utopian societies) or fact. 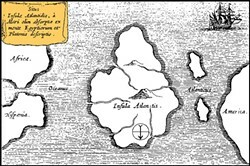 Dozens, if not hundreds, of locations have been suggested for an actual island or continent of Atlantis. One popular candidate is the small Greek island of Santorini, or Thera, remnant of a massive volcanic blast dated to about 1600 BC, the "Minoan eruption." Although the location doesn't fit — Atlantis is supposed to have been west of the Mediterranean, not within it — the fact that an explosion four times the intensity of Krakatoa virtually annihilated an entire island resonates with Plato's story. Other favored locations include Troy, the Dogger Bank in the North Sea (which was land until rising sea levels flooded it around 6000 BC), the Canary Islands, Greenland and (of course) the Bermuda Triangle. In a grim turn of events, the Nazis appropriated Atlantis for their own ideology of racial superiority, building on the writing of Madame Helena Petrovna Blavatsky, co-founder of the Theosophical Society (precursor of the New Age movement). Dictated in Atlantis, no less, her 1888 book The Secret Doctrine illuminated the evolution of entire races, including the genesis of superior Aryans. Nazi propagandists ran with her hogwash, using it to justify the genocide of "inferior" races. Like the Garden of Eden, Atlantis lives on in legend, each generation adding another layer to the story. What's real and what's myth? As the editor said in The Man Who Shot Liberty Valance, "When the legend becomes fact, print the legend." Barry Evans (barryevans9@yahoo.com) has his own theory about Atlantis, which features dinosaurs. Obviously.